Made in the U.S.A. Quality Scooter! 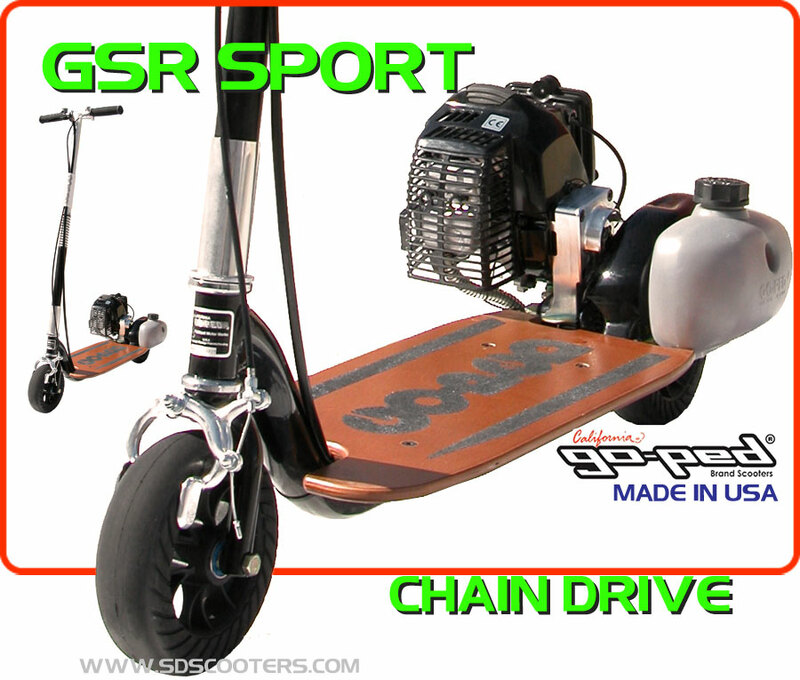 Take the best of the goped sport and combine it with the essence of the GSR - the resulting gSR sport model has it all. Its compact like a sport and has a chain drive like the famous GSR models. The GSR sport is the latest goped and some feel the ideal gas powered scooter. Goped's have always been bullet proof and the GSR sport is no exception - it utilizes a patented lightweight heavy duty frame the new fuel efficient gpl290 engine and the strong and simple goped folding mechanism. All of this perfection comes in sinister black for the most impact. everyone in the family will love this scooter! Here at SDscooters we believe in offering excellent value, real live USA based customer support and the best in optional parts. Scooters, Go-karts, and Pocket bikes are our specialties and we offer a complete part list for every model and full tech support. Go ahead and give us a call if you have questions or need a recommendation, our experts are happy to assist. When ordering the GSR46r don't forget to add a seat kit to make your scooter a a great Commuter Scooter that can actually keep up with local street traffic or go for more power and out fit it with a performance exhaust. We offer these options at deep discounts because we want your business. * Goped scooters are built to order at the factory - there is usually a 1-day to 1-week lead before shipping. Occasionally it will be up to 14 days. If the build is expected to take this long we will let you know. Please make sure to call us after making your purchase - we like to go over your order with you to confirm the warranty terms and to make sure its the best selection for you - your order will not ship until this conversation has taken place. Mechanical aptitude is highly recommended for all gas powered products. Shipping applies to optional and free items. Please wear protective gear and ride safely. **Be sure to familiarize yourself with local regulations before purchasing.